There's simply no question that color often plays a tremendously important role in consistently putting fish in the boat or on the bank. As I detailed in my previous column I wouldn't feel that way if I hadn't seen it proven time and again in my own fishing. And I've known others, some with unduplicated experiences, who say the same darn thing. Let's suppose, for example, you're a guy who has a special job with one of the nation's major tackle companies that specializes in lures for bass. That company has loaded your truck with an assortment of the lures it markets. Your job is to use that truck to pull your bass boat all over the country. Gotcha! Bass can be cagey critters. Show them something they've already seen 10,000 times and they'll likely not respond. Sometimes a simple color change in the same lure brings results. At each stop you make you've been directed to contact fishing writers like myself or perhaps that area's top bass anglers. Your objective is to take each of these guys fishing and show them just how effective the company's lures can be when properly used. Sounds like quite a job doesn't it? Believe it or not, a guy who turned out to be a good friend actually had such an occupation for a time. Some years ago I wrote a magazine piece about a man named Blackie Lightfoot. Blackie is the guy I'm talking about. Blackie was from Texas but he pulled his bass boat from Maine to Washington State showing those I've mentioned how his company's products caught fish. 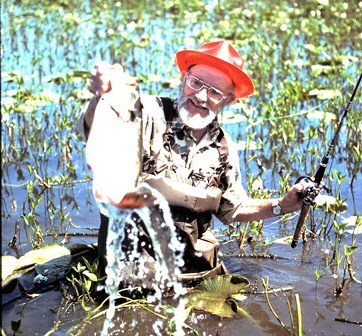 Anybody who took on a job like Blackie's had to learn a heap about bass fishing---including whether or not color played a role in a given lure's effectiveness. 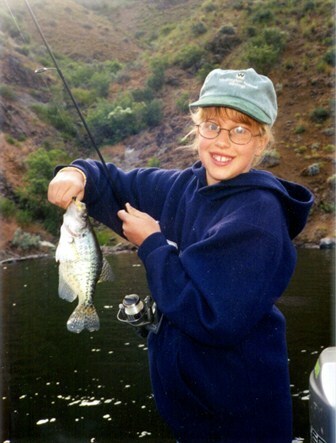 I fished with Blackie at Shastina Lake and Lake Siskiyou in Northern California and at the Potholes Reservoir and Silver Lake in Washington State. Did Blackie's travels around the USA, fishing lots of different places in the process, convince him color made a difference? You better believe it! This old gold colored Cordell Red Fin didn't get as beat up as it is from being thrown against rocks. It's one my late friend Blackie Lightfoot used when he was dragging a bass boat all over the country, fishing as he went. This gold colored Red Fin put countless bass in Blackie's boat. As a matter of fact I watched him demonstrate it. One of the lures Lightfoot favored most wherever he fished largemouth bass was a Cordell Red Fin. 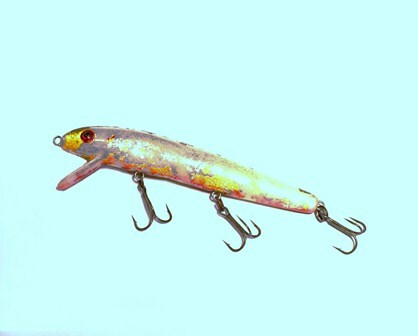 The first color he turned to in this lure while in Tennessee or Texas or in the Pacific Northwest was a gold shade. "I've had really good luck on the gold color in this lure," Lightfoot told me. "It has been my most consistent producer for largemouth bass all over the country." My friend Blackie is gone now. He passed away several years ago. I treasure the memories of the fishing trips I made with him. Blackie was an artist with the Red Fin. It was fascinating just to watch him fish it. He managed to do things with it that aren't easy to duplicate. Certainly the way he handled the lure was important. But so was its color. 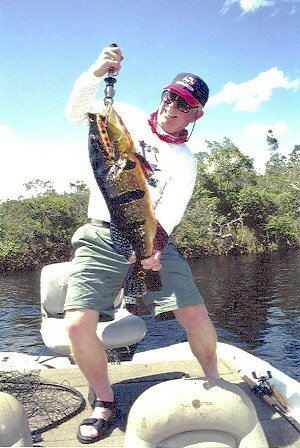 Something else he often did with the Red Fin involving color was to paint a red stripe along the belly of the lure. He carried a small bottle of red paint in his boat. Every now and then if he wasn't getting the kind of results he thought he should, out came the paint to give his lure a red stripe on its belly. Like I said, anybody who travels all over the entire country fishing as he goes has to learn something in the process. 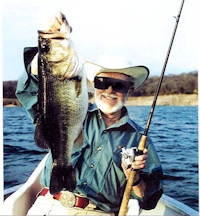 Blackie Lightfoot was one of the best bass anglers I've ever met. When somebody with his kind of experiences tells me about the importance of color, I'm going to listen close up and careful. Every now and then over the past half century I've seen reports from acknowledged experts who've conducted tests involving how bass feel about colors. Just the other day I came across a column written by a writer named Mike Wallace, of Arizona. Mike detailed how he had kept a pair of bass in a 55-gallon water tank. There was a pair, that is, until one wound up eating the other. Crappies are also color conscious.White, yellow or combinations of the two are often good producers, but there's no guarantee.Sometimes a completely different color gets more action. When Wallace offered the remaining largemouth a hookless feathered jig in a yellow color, the bass smacked it with no hesitation. It did that a couple of times, then quit paying much attention to it. When a different colored jig was introduced---wham! The bass grabbed it just as it had the first time it got a look at the one of a yellow color. Wallace said he could also get the bass to hit by changing his manner of presentation. His conclusion: Bass have a darn good memory. They can also determine shape, size and color. As I've mentioned, this isn't the first time I've seen similar reports. Every darn one of them tend to back up what I've had occasion to observe over the years myself. And color doesn't make a difference only where bass fishing is concerned. If you ever drive along the lower Columbia River where it divides the states of Oregon and Washington, take time to talk to some of the anglers who congregate along the big river's broad beaches. 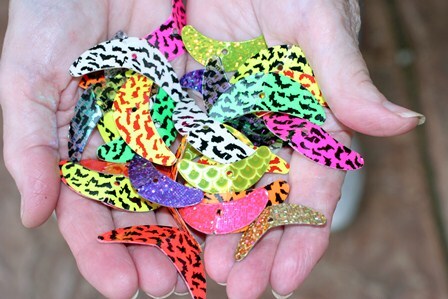 Ask them if they have favorite colors in the different lures they heave out into the Columbia's heavy current. You'll discover they do. They'll tell you this color or that one is catching most of the fish. You're looking at a double hand full of Mack's Lure Smile Blades. These easy turning Mylar plastic blades slide right onto your line or leader. Walleye anglers around the country have been having excellent success with them. The color that works best this week might not necessarily be as productive a month from now. Your best bet is to change colors until the fish start telling you what they want. Color is certainly a consideration if it's steehead you're after. I remember fishing a stretch on the North Fork of the Toutle River in Southwest Washington one morning before Mount St. Helens went on her rampage. An angler across the river hooked six steelhead while all I got was casting practice. I finally hollered across and asked him what he was using. "I've got a Number 8 Spin-N-Glo in red and chartreuse," he hollered back. "That's what they want this morning." He was right. As soon as I changed to that lure, I too started catching fish. That color was often effective for steelhead in other lures and in other rivers I fished when I still lived in a steelhead country. Like I said in the beginning, that pinhead in the restaurant booth I told about in my previous column didn't know squat about bass fishing. I hope the guy with him that morning wasn't buying the nonsense he was peddling. Even those wild-eyed peacock bass of the Amazon jungle often exhibit a color preference in lures.Look at that big bright plug this one smashed. Anglers with sufficient smarts to tie an Improved Clinch Knot know it's wise to do all we can to bend the odds in our favor each time out. Paying close attention to lure color is one way to do that. If you aren't, you should be. Don't keep throwing the same color lure hour after hour if you're not getting results. Start changing things. You just might discover that like the title of this two column series says, "Often Color Is The Key." No one in the western United States has written more about bass and panfish angling than Stan Fagerstrom. Stan wrote his first outdoor column for The Daily News in Longview, Washington way back in 1946. He's been at it ever since. At one time or another his articles and columns have appeared in most of the nation's major outdoor magazines. Stan is also known internationally for his casting skills. He has been featured in outdoor shows all over the United States as well as a number of foreign countries. He is a member of both the National Freshwater Fishing Hall of Fame as well as the Bass Fishing Hall of Fame. He has also been honored by the National Professional Anglers Association. Stan lived most of his life in Washington and Oregon. He and his wife moved to Sun Lakes, Arizona in late 2004.